Connect with the recordings and powerpoints from this webinar presented by UNDP and FAO, together with UNITAR, which explores methods, tools and best practices to demonstrate effective institutional and individual capacity development approaches during the formulation and implementation of National Adaptation Planning. 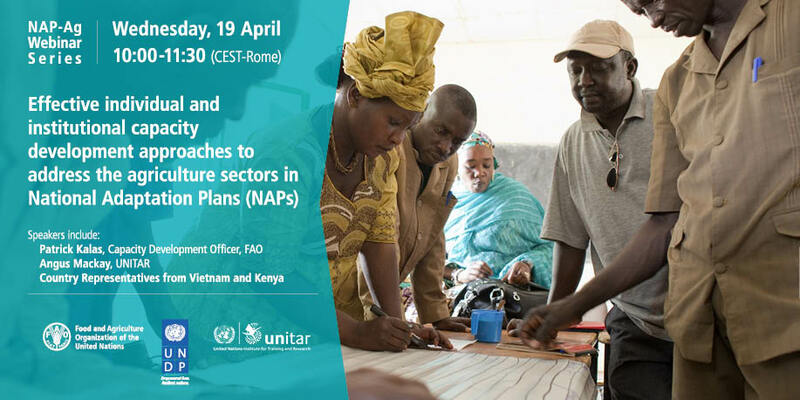 Discover the objectives of the Integrating Agriculture in National Adaptation Plans NAP-Ag Programme and how to integrate climate change risks and opportunities as they relate to agriculture sector-related livelihood options within existing national planning and budgeting processes. Organizational and Institutional Capacities – Patrick Kalas, Capacity Development Officer, FAO. Effective capacity development can be seen as a good development practice to achieve more sustainable and impactful results. It deepens country ownership, encompasses 3 systemic dimensions and is to be enhanced interdependently, including: individual (e.g. skills and knowledge); organizational (e.g. coordination, mandates, multi-stakeholder processes); and enabling environment (e.g. governance, policies and legal frameworks). Capacities can be enhanced through a range of interventions beyond training only: E.g. strengthening multi-stakeholder platforms, coordination mechanisms, policy alignment etc. Capacities need to be jointly assessed with stakeholders, appropriate interventions jointly designed and results jointly tracked. Capacity development should be country- and context-specific, tailored to specific national needs, rather than regional needs which are more heterogeneous. Enhancing organizational and institutional capacities for NAPs should be cross-sectoral, multi-scale (from local to national) and multi-actor (involving e.g. private sector, NGOs). This includes strengthening horizontal and vertical coordination mechanisms as well as multi-stakeholder / actor platforms. A step-by-step guide how to apply effective CD within NAPs will be available shortly (i.e. Supplementary Guidelines for Addressing Agriculture, Forestry and Fisheries in National Adaptation Plans). Skills Assessment for National Adaptation Planning – Angus Mackay, Head of the UN CC: Learn Secretariat and Manager of UNITAR's Climate Change Programme, UNITAR. For assessing capacities and skills it is essential to define which skills are needed and for what. For example, in the case of integrating agriculture in NAPs, the ‘WHAT’ could be about integrating national adaptation planning in the agriculture sector; or enhancing national coordination in planning in the agriculture sector. Skills that may be needed vary and could include technical (usually the focus of capacity development for adaptation); management (e.g. planning, coordinating); or participatory (advocacy). In each case skills development needs will be required at different levels, from policy making skills, organizational skills and operational skills. This analysis can then lead to a targeted skills development plan which countries can use to become more systematic about capacity building for individuals. Case Study of Kenya in Assessing Capacities - Zipora Otieno, National Coordinator of the Kenya project for Integrating Agriculture in NAPs. In Kenya, a capacity assessment exercise was conducted by the NAP-Ag Programme to inform a Capacity Development Plan. This included a literature review, interviews and a self-assessment carried out on 6 government institutions. The assessment focused on four functional capacities: policy, knowledge management, implementing, partnering; each of these was assessed in 3 dimensions of individual, organizational and enabling environment. The assessment identified four priority areas of support: strengthening multi-stakeholder engagement, creating an enabling environment for policy implementation, enhancing individual technical capacities for design and implementation of programmes, and gender-responsive budgeting. Some of the assessment recommendations are already being implemented, with financial support from the NAP-Ag project. The country has also embarked on resource mobilization from the Green Climate Fund for a broad-based capacity development initiative. Kenya has good knowledge, plans and policy documents, but implementation remains a challenge. In addition, more efforts need to be channeled towards packaging scientific information to different end-user groups/duty bearers in a manner that is effective. In the case of Viet Nam, UN and WRI Guidelines on Skills Assessments for NAPs were adapted to the national context. A range of stakeholders were assessed, including Ministries, provinces, NGOs, research institutes, local people. Identified priorities for capacity development included climate impact assessment; linking climate data to practice/policies; and suitability of adaptation options. As in Kenya, policies and strategies are in place but implementation requires strengthening. The NAP-Ag Programme is supporting trainings and materials on prioritized topics. The role of the private sector in NAP processes and capacity development was highlighted. Their engagement especially in the implementation of NAPs and NDCs is essential.